• Authentic Colorization Process by the Merrick Mint. • New & Brilliant Uncirculated Condition. 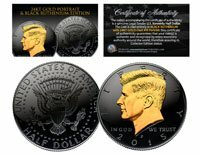 • Authentic Kennedy Half Dollar. • Comes in air-tight acrylic coin holder. • Full Color Certificate of Authenticity included. • 24 Karat Gold Plated. This CHINESE NEW YEAR 2019 – YEAR OF THE PIG COIN is lucky money and a treasured collectible.